As a business owner, it can be confusing and sometimes downright scary to wander the world of email marketing solutions. While you’re an expert in your own field and industry, figuring out ways to get your message across and analyze response can be like wandering in a land where nobody speaks your language. You want help. You need it. But you’ve no line item in your budget for high-priced agencies that promise a lot and deliver very little. This is where SendPulse.com can step in from the get-go, say the principals helming this enterprise. They will assess your business and objectives and help create a system that delivers the digital goods. Will SendPulse make your coffee? Not likely—but this resource will show you how to create professional e-mails, segment your customer lists by criteria, personalize every message so recipients feel special, introduce you to the fun of working with a drag and drop email editor and the number of templates available to you as a member of the SendPulse.com family will make you feel like Michelangelo minus the scaffolding. Sound too good to be true? We set out to review SendPulse (https://sendpulse.com/) to find out what subscribers can expect from this feisty resource. At first blush, we were taken by the number of freebies offered to business owners, so we had to quash our inner skeptics before we could begin to explore the heart of this marketing entity. We began by test driving this site on your behalf, so we headed to the website where we were introduced to the basics and learned that SendPulse offered a single platform that promised us that we could get the hang of sending out emails, manage web push notifications and SMS while creating hybrid series of customer-friendly communications that effectively target audiences. So far so good. We learned about the easy-to-use scheduler that can enable us to increase our CTR conversions while saturating delivery channels as well as integrating scheduler and subscription forms. Automation gets two thumbs up—-as do facile integrative systems that give business owners the power to interface online shopping cart scripts with the nuts and bolts of their marketing efforts. Once we got the hang of it, we were impressed by the ease of data integration that made us feel like brainiacs. Score one for the SendPulse folks. By test driving some of the company’s website features, things made sense, so even business types who are relative neophytes when it comes to technology should be able to use the functions properly. 1. Our desire for a newsletter that would inform, educate and entertain not only met our criteria for creativity, but the ability to output a respectable publication in just minutes proved eye-opening. 2. 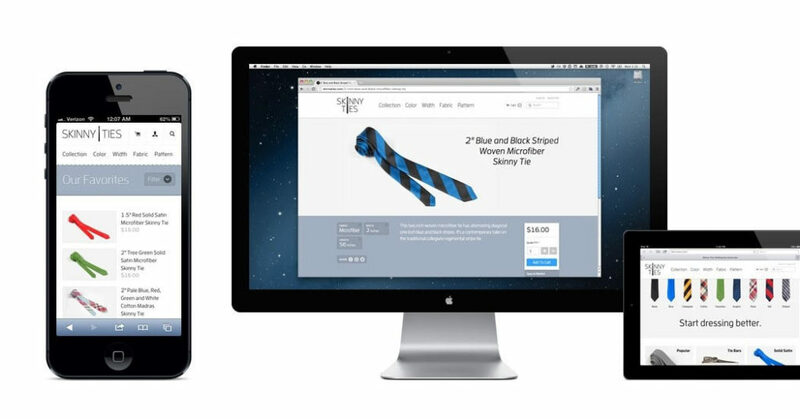 We liked the ability to divide our hypothetical customers into tracking segments. We were able to divide our universe into useful categories like gender, location, history, interests and even click-through rates. What business owner wouldn’t find this segmentation feature valuable? 3. 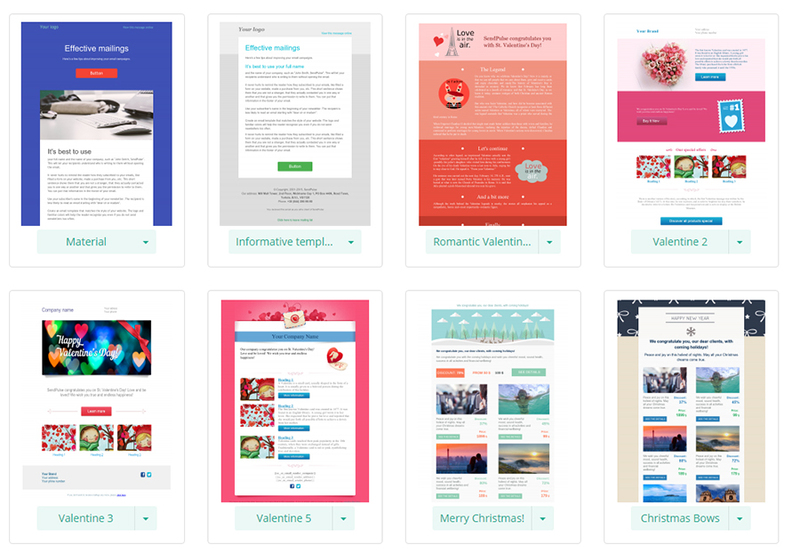 We developed an appreciation for 100 artfully designed email templates offered by SendPulse. A fellow reviewer working said, “Who needs a graphic artist on staff with this kind of capability?” She’s right–and the secret behind this feature is drag and drop editing, so users should experience little to no learning curve. 4. 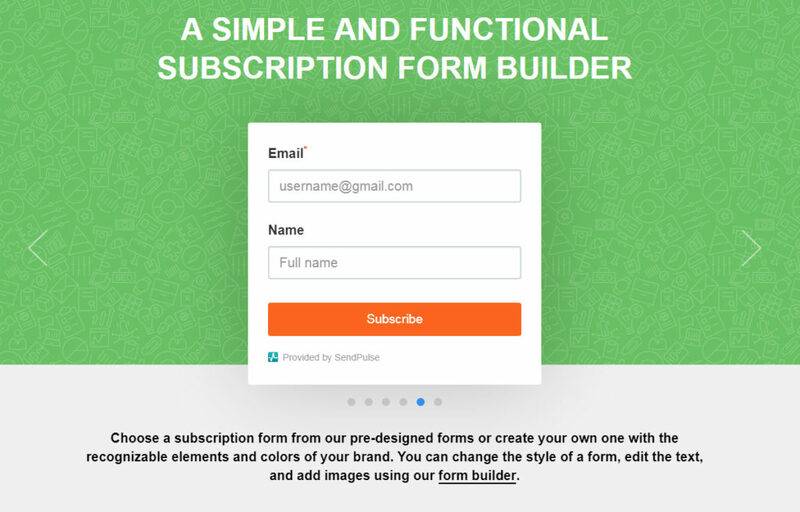 Even old-school business owners understand the importance of personalization and a subscription to this service delivers this ability. SendPulse stresses the practicality of personalizing when it cites this funny example: Businesses that personalize won’t make the mistake of offering guys on lists discounts on dresses! 5. We evaluated the subscription form generator with a critical eye and concluded that new subscribers don’t get lost in the Land of TMI. It’s a simple function to collect email addresses and then point recipients in the direction of landing pages, blogs and special offers that populate newsletters business owners already produce. 7. Automated email features are particularly compelling. What business owner wouldn’t want to be able to thank new subscribers, send birthday greetings or remind rank and file of previous emails sent that haven’t been opened? You set parameters and the system takes over. Here’s icing on the cake: the system even re-sends unopened emails! But that’s just the beginning. In addition to all of the traditional automation features SendPulse offers some innovative tools – their AI platform analyzes how the recipients interact with communication campaigns and builds a custom profile for every subscriber. Based on that data the system can automatically determine the best time and medium to send all subsequent messages to every particular subscriber. That is basically a one click method to maximize your email open rates and overall audience reach. Statistics show that with this feature enabled you can get an increase of as much as 50% to your initial open rate. We were struck by the fact that business owners who affiliate with SendPulse don’t have to be IT professionals or statisticians to take the pulses of customers—literally–so our next examinations focused on the most critical aspect of all: keeping tabs on the numbers that prove marketing campaigns are either successful or a disaster. This classic marketing instrument has been around forever, but business owners get the digital version. Want to find out whether customers prefer drone delivery to rail? SendPulse codes your customer list by the three colors you see on traffic lights: The system attaches a call-to-action to the color red; a different one to the green list and whichever grabs the best response is then compared to the entire list to determine which message, graphic or discount is the most popular. Even if a business owner never took a statistics class, he or she will likely understand numbers generated by the SendPulse system because it’s broken down into segments that are easy to select, sort, understand and analyze. Among the criteria a business owner can select for are totals of subscribed users, click rates, open rates and geographic location responses. Recipients can see who accessed which links, who didn’t respond to invitations to click on links and come to conclusions about how to improve those stats. For today’s business professional, the words Google and Analytics are enough to send pulse numbers into the stratosphere because everyone on earth knows that the proper use of Google Analytics can turn a mediocre email campaign into a winner. SendPulse affiliation allows customers to get the benefit of this resource, so business owners can get as nosy as you like about how many bucks e-mail campaigns generate, how many individual responses were reported, the amount of time respondents stay on a site and even the number of pages they review. A smorgasbord of tools is available to business owners who employ in-house developers, but for those who can’t tell a third-party application from a third-party congressional run, a team of SendPulse geeks is happy to assist subscribers, and there’s no need to speak Developese to understand them. We have it on good authority that SendPulse professionals are adroit at using Zapier, WordPress, CreateForm, WooCommerce and equally quirky apps and resources that benefit businesses. It’s as important as milk these days and just as nourishing, so business owners can pour themselves a tall glass of mobile-friendly email services that allow companies to churn out a consistent flow of graphics, messages, texts and marketing materials that are easy-to-read, crisp, sharp and bold (yes, that includes images) whether recipients get this info on iOS or Android platforms. Eager to send batches of e-mails at the speed of light? Access the SendPulse SMTP server and enjoy advantages that include the use of two additional communication channels, SMS and push notifications. Blanket customers with late-breaking news on the fly. Email deliverability has never been this efficient and fast. Why would business owners opt for the pony express when a missile is at their disposal? This feature is especially important when a business deals with overseas entities; SendPulse can help you send SMS messages to customers in 200+ nations. Ask marketers whether redundancy is the key to successful communication and expect to see a lot of head nodding. Short, punchy messages that announce and then reinforce a business’s latest discounts, sales, product introductions and promotions will always be more effective if sent repeatedly until the value of these communications registers in the minds of readers. -SendPulse starts with an offer even the Godfather couldn’t refuse: If you’re still growing your business, have 2500 subscribers max and you average 15,000 emails monthly, put away your checkbook. SendPulse offers free plans to small businesses eager to grow. -For the cost of lunch, snag a monthly subscription to SendPulse and use services for $9.85 per month if you’ve got 2,500 customers on a list. That capacity can increase up to 500,000 subscribers and as numbers increase, the per-message cost continues to drop. -For firms that only require a modest number of email deliveries, business owners can contract with SendPulse to output 10,000 a month using their “pay as you go plan.” The cost for this service will set you back $32, but as traffic increases, a business can output 2 million messages, and the per-email cost drops accordingly. -SendPulse offers a VIP plan, but keeps details under wraps. We’re not sure why, but perhaps principals don’t want competitors to know what they’re up to. Since requests for price estimates are handled immediately, business owners who are curious about pricing associated with that VIP plan need do nothing more than inquire. -Businesses will like the fact that first 12,000 emails in this category cost nothing. Double that number of emails as a business expands and SendPulse will bill you $8.85 each month as a subscriber. -For businesses whose volume remains low, the pay-as-you-go plan should do nicely. For the cost of two movie theater tickets ($15 USD) a business can send out 10,000 emails. As traffic increases, SendPulse can broadcast up to 100,000 monthly emails on a client’s behalf. What else should I know about SendPulse? Before we wrap up this review, we believe it is important that you know whether the team that promises to elevate a business from marketing novice to high-rolling traffic generator is legit and after reviewing this digital marketing enterprise thoroughly, we believe SendPulse and staff stand behind their promises and intend to become even more resourceful on behalf of clients in the future. SendPulse employs a balance of bright, well-trained talent and while you’ll need to ask them about the degree of cyber-security they have in place (it’s not mentioned on the website), SendPulse is driven by a wide range of experts: web and mobile developers, sales gurus, an impressive bunch of technical support geeks and a creative collection of marketing experts. We got the feeling that this team takes seriously its mission to beat the competition and toward that end, business owners are invited to scope out and compare high-profile service providers like MailChimp so they can match up services and prices. Not every technology company feels confident inviting comparisons, so we conclude that SendPulse is somewhat fearless. In the realm of digital marketing, that’s a good thing. Is SendPulse Any Good When It Comes To Customer Service? We were favorably impressed by SendPulse’s responsiveness. For business owners who find themselves online at 3 a.m., it’s good to know that an IT team has a company’s back 24/7. In terms of inter-office cooperation and vigilance, we got the feeling that customers sleep better at night knowing that SendPulse experts stand watch 24/7 to respond to problems and nip them in the bud before they morph into catastrophes. As a reviewer, our job is also to examine pros and cons and accurately report both to business owners evaluating resources before they make a fiscal commitment to a company that will manage any business’s greatest asset: it’s customer data. While some of the tech-speak on the SendPulse website could be over the heads of business owners seeking email, SMS and Web Push marketing services, that’s the only criticism we could find. If your instinct tells you that SendPulse is the final puzzle piece you need to complete a long-range marketing plan, don’t ignore it. We are impressed. You may be, too. Got questions this review haven’t answered? Let us hear from you—-before or after you take a free test run to see how SendPulse can work on behalf of your business. Feedback is always appreciated, so don’t hesitate to pose the most complex questions—-keeping in mind our opinion that staff will take uncomplicated questions just as seriously!